Redeemed my Lukiegames points to get this masterpiece. I absolutely love the cover art, it's kinda shiny. This game never gets old and I am glad to own it again after so many years. What can I say I love Crash Team Racing it's one of my all favorite games but then again I'm a big fan of the earlier Crash Bandicoot Games so it's no surprise that I give this game so much high praise but it deserves the love I'd highly recommend this for any racing game fans cause it's really fun.It works great and it arrived on time thanks LG. It works well, and the cover looks brand new! Extremely satisfied. The game is very good. No hiccups at all. My husband and I played this game over and over. BTW, we are 70+. Never too old for FUN! Will be getting all of the retro games we can from Lukie. Never disappointed. Does this game work for the ps2? I was amazed at how great the condition of the game i received when I ordered it! 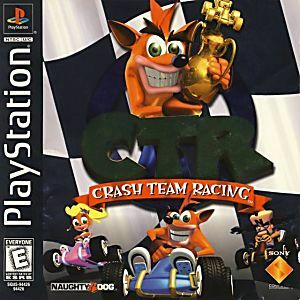 CTR is a fairly old game, but the condition made it seem new! NO SCRATCHES! Thanks Lukie Games! Love this Game! It's fun and challenging and we can playit as a family. Pfft, what's a Mario Kart? Fun, loads of replayability, exciting, gave me many, many hours of play. You like Kart racing? Multiplayer games? Get this. I can't not sing praises about this game. This wonderful game. Awesome game !!!! Lots of fun to compete with your friends !!! Love this game !! I love this game even more now! :D I'm so glad I could find it again! Best purchase ever. No scratches or anything.